Due to our work nature, we have to examine different shopping cart platforms. Recently we have taken a close look at X-Cart Classic and decided to make our comparison of two great solutions - CS-Cart and X-Cart. CS-Cart 4.1.2 was released on January 28, 2014. X-Cart Classic 4.6.2 was released on February 4, 2014. Our aim is to show the differences, advantages or disadvantages of both platforms. If you choose between CS-Cart and X-Cart, hope our review will give light to some important aspects. Now let us make a comparison between CS-Cart ($385) and X-Cart Gold Plus ($395) as both of them have a similar architecture, functionality and features. 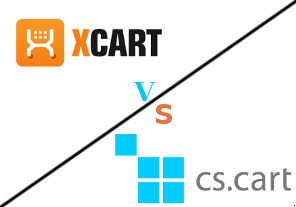 From the table above we can see that CS-Cart and X-Cart have a large number of similar features, which may successfully serve to creating a perspective ecommerce shopping cart. But there are also some key differences. There are 7 languages that are already built in CS-Cart by default (English, Italian, Germany, Norway, Hungary, Japanese, Russian). In previous CS-Cart versions there were even more languages available such as Spanish, French, Dutch, Greek, etc. We hope they will be also included in CS-Cart 4 soon. Anyway, you can always translate all language variables by using the on-site translating mode or via Languages in the admin panel. In X-Cart we can find only four built-in languages - English, French, German and Russian. But in case you want to have a different language on your site you can translate the site content using .csv file with language variables. One more variant is to purchase fee-based language packs via the X-Cart marketplace. The default CS-Cart template is modern and very nice. Also, it is possible to create your own website look using the Built-in Theme editor - change storefront colors, fonts, logos, backgrounds in real time and without a single line of HTML or CSS code written. Also, you can choose available storefront style from the list. But the CS-Cart skin is not responsive. The default X-Cart template is rather good. There are several available templates to choose from for X-Cart and one of them is responsive. Responsive design means that your website will look good on different screen sizes including mobile screens. It is a really great X-Cart advantage. Official eBay integration module is available for CS-Cart 4 for $125. It's a one-time purchase, that means a good money-saver. Talks about Amazon integration were around before, but no exact plans are known. X-Cart offers eBay integration module for X-Cart 4.3 - 4.6 according to a subscription plan (from $19.95 to $149.95 per month depending on the number of products you have). Amazon integration is not available yet but promised to be in the future. X-Cart doesn't have such a feature. One of the key CS-Cart benefits is its Multi-Store capability. It is really convenient for those who plan to have several different stores and administrate them easily via one admin panel. Even a free CS-Cart version is multi-store capable. In X-Cart there isn’t such a solution yet. But X-Cart team can develop a custom modification which will allow you to have multiple storefronts and manage them via one admin panel. The cost of such modification will depend on its complexity and customer needs, the initial price starts from $900 (quoted by X-cart in November 2013). There is a built-in Twigmo add-on that makes CS-Cart store mobile-friendly for both a customer and a store administrator. It's free if you have up to 1000 products. $9/month for 1001-10000 products and $19/month for 10000-50000 products. As for X-Cart there is a ready-to-use X-Cart Mobile edition which allows your site to look and function great on all mobile devices. The one-time fee is $299. 7. Also, there are some minor differences between CS-Cart and X-cart. For example, CS-Cart has a possibility to display the promotion text and the Brand name on the product details page and allows to watermark images. X-Cart doesn't do it by default. But X-Cart, unlike CS-Cart, has a built-in Greet Visitor module that greets a customer by the name when he/she returns to the site, Bill me later feature and Add to cart pop-up that shows related/also bought/random products. And some other minor differences. In general, we have good impressions about both platforms. Each one of the presented e-commerce platforms can become a right solution for your business. You just need to choose what suits you better. If you would like to have and easily manage several online stores, you'd better choose CS-Cart. If you don't need a multi-store feature or widget mode, but responsive template is the highest priority, go for X-Cart. In general, CS-Cart (both the storefront and admin back-end) looks more up-to-date than X-Cart, and CS-Cart translated to more languages. But it's always up to you to make a choice. When choosing an e-commerce platform we always recommend everyone to try demo to be sure in your choice. Thank you for reading Alt-team blog! "As a user of CSCart for many years and with several clients on it using each version, here are a few additional points gleaned from experience. --Rarely a glitch. Once you get the hang of products, images and bulk edits, it's a tool that can be used daily successfully. --Online documentation is occasionally out of date and makes for extra unnecessary work and cost when asking for support. --Presales questions. Because I am an existing customer, they try to charge for it. This is consistent and odd. --ETA's for new features often lag behind their estimates, such as having a "Responsive" layout to the store. Today, they estimated 3-4 months. But clients need this now so in this case it was a deal killer. December 2013 ecommerce stats say 54% of shoppers were on portable devices. This is a must and Simbursk is behind the curve. If you don't care about support glitches and "Responsive Layout" does not matter, this is a solid store solution. "